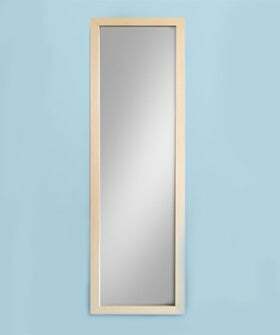 Would You Buy A "Skinny Mirror" For $675? In today's very important news, a graphic designer named Belinda Jasmine has come out with a line of Skinny Mirrors that are specifically designed to make women look thinner than they are. These tricky suckers retail for $175 to $675 dollars, but, hey, says Jasmine — it's cheaper than plastic surgery! While we think this is ridiculous, we do appreciate that Jasmine seems to genuinely wants to do her part to boost women's confidence. ("If we can give you a little extra confidence before you take the world on in the morning, we’ve done our job,” says the company.) That being said, how real can the positive feelings be, if you know that you're starting every day by lying to yourself? The confidence boost provided from a mirror you know is bogus can't last long. And, of course, there's the problematic concept that looking "skinny" is ideal — which is another story entirely.